Grout Bully works wonders when it comes to cleaning grout because it uses a strong nanotechnology formula that gets through the grout and rids it of mold, mildew, germs and bacteria. When the main reason behind staining grout is eliminated it’s easy to get a crystal clear finish that would be suited for showroom display. Regular scrapers are tedious to use while you can get paint pens; but you only get them in white and they don’t work on large groutlines. 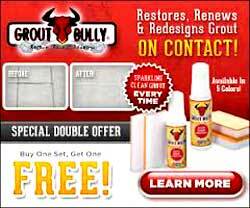 For that you need Grout Bully, which not only cleans grout but also renews it as it were freshly regrouted. Now save yourself huge repair bills with the help of Grout Bully, which is effective and easy to use. You can use Grout Bully on the floor in your kitchen, bathroom, walls and also kitchen counters. All you need to do is line it against your grout line and gently press down and apply. You can wipe off the excess and see the results. Grout Bully covers about 500 square feet area, making it highly feasible and it saves you a lot of time as well.